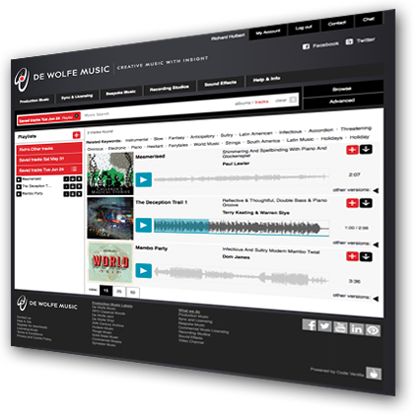 De Wolfe are the largest independent music library in the world and they have been producing and publishing music for over 100 years, so there is an enormous catalogue of music. After nearly ten years of faithful service the De Wolfe site was looking tired and in need of some serious love. Ten years ago if you wanted library music you turned to a shelf of CDs or a desktop program to help you find what you were looking for (over the years we did quite a few of those!). Now the web site has become the main distribution channel for all of De Wolfe’s Music worldwide. As their digital partner of 15 years, we understood the challenges in taking on this project. The site would have to balance aesthetics and function with a blend of new features and a new visual identity. It had to be easy for users to search, audition, create playlists and ultimately download music but it also had to respect the visual heritage. De Wolfe have created some really wonderful album covers and we were all keen to make sure they were part of the searching experience. What you see as a user is only the tip of the iceberg and behind the scenes we created a vast catalogue administration area that allows De Wolfe to prepare content and manage tens of thousands of tracks. This includes the manual and creative task of building and assigning keywords. We have helped librarians by creating topics that help them moderate their keyword assignments where tracks will have an optimal number of keywords for instrumentation, emotional content, usage, genre etc. Other technical challenges existed around protecting the high-quality downloads and syncronising complex data with multiple external systems. You can read more about that journey in Dominic’s Tech Blog here. Last updated by Richard Hulbert at June 26, 2014 .